Ken Ham, founder of Answers in Genesis, has brought together today's top Creation Science authors to produce this fantastic resource. It addresses over 30 questions on evolution and the reliability of Scripture. Essential reading for those in search of biblical responses to the claims of evolutionary theory. 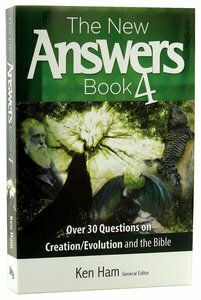 About "Over 30 Questions on Creation/Evolution and the Bible (#04 in New Answers Book Series)"
For those who desire a deeper walk and a thriving faith in the face of a growing cultural adversity, here is the newest book to spur the heart and mind to give glory to God. From the lies of evolution to genetic engineering, this powerful team of apologists is able to inspire you and those you know who may not yet believe. Ken Ham is the president/CEO and founder of Answers in Genesis - U.S. and the highly acclaimed Creation Museum. Ken Ham is one of the most in-demand Christian speakers in North America. Ken's emphasis is on the relevance and authority of the book of Genesis and how compromise on Genesis has opened a dangerous door regarding how the culture and church view biblical authority. His Australian accent, keen sense of humor, captivating stories, and exceptional PowerPoint illustrations have made him one of North America's most effective Christian communicators. Ken Ham, founder of 'Answers in Genesis', has brought together today's top creationist authors to produce this fantastic resource - essential reading for those in search of biblical responses to the claims of evolutionary theory.